There is no better way to describe Zandari Festa than with the word “global.” Ever since the showcase festival’s establishment in 2012, an increasing number of international acts are signing up to perform in the heart of South Korea’s indie music scene — Hongdae. Unlike Chelsea who scoured the basements of Hongdae in the fall of 2015 and 2016 for the Festa, I was fresh blood ready to be won over by new faces and voices. Armed with an all-access press pass, I embarked on a journey to conquer the 11 venues and 140 acts from 25 countries. Zandari Festa 2017’s line-up saw many names familiar to Seoulbeats writers and returning festival attendees. Wasted Johnny’s, Guten Birds, LudiSTELO, and GoGoStar have been given the spotlight on Seoulbeats’ Indie Gems and continue to be well loved. International groups like Singapore’s Iman’s League have gained themselves a following in Korea, returning after their performance at South Korea’s World Cross Border Festivals 2016. It was fascinating to watch language barriers being broken down through music, with Zandari Festa 2017 moving up a step in connecting musicians from all over the globe and providing a showcase platform for these emerging acts. The festival opened each of the first two days with a conference discussing various aspects of music markets in places such as Asia and the UK, as well as providing helpful tips on marketing strategies. These sessions addressed the backstage of music production, and having this component as part of the festival pushes it up in the ranks as more than just a performance stage. It was a pleasant surprise to find such resources available for new artists needing some help in establishing and advertising themselves. Leaving aside the intellectual business, the sheer number of acts across the multiple venues was daunting at first. Selecting which groups to see was a tough one, but I set my heart on discovering groups I had never heard of before. Zandari Festa 2017 did not disappoint with its line-up – countless acts captivated the hearts of audiences in a short span of two days. I missed the first day of the festival, so my exploration started on the Saturday of 31st September, a good day as any to delve into the underground of Hongdae. The first venue I dropped by was none other than the infamous Rolling Hall. Known as Hongdae’s music mecca, the arena has hosted a diversity of performances including popular names like Day6, 10cm, Loco, and Vismajor Company’s concert. Rolling Hall’s shining label framed its entrance as the venue echoed with the heavy bass and guitar riffs of Sons of Tiger. The 3-piece rock band consists of brothers Joh Seong-min on the guitar/vocals and Joh Seong-hyun on the drums, with bassist Choi Hyung-wook completing the group. As people started trickling in, the band began their repertoire of songs from their previous EPs. The mixture of blues and garage rock sounds was especially appealing, and the band’s personality could easily be distinguished in their music. In retrospect, this was a crucial factor allowing them to distinct themselves from the numerous other rock bands at the festival. Exuding an edgy front balanced with groovy bass lines, the band’s music pulsated forward without losing control of their audience. Particularly, the track “TOM” from their second EP Bottom of the Heart snatched the audience’s hearts with its guitar and bass solos. In the echoing space of Rolling Hall, the rawness of a live performance amplified the charm of the delivery, and the track stands as a testament to the band’s musicality and individuality. The band also revealed that they were in the midst of preparing their 1st full volume, offering the audience with a sneak preview of one of their new songs. Briefly and jokingly described as a kind of vacation song, guitarist and vocalist Seong-min introduced the track before delving straight into it. By the end of the hour-long showcase, I had become a fan. Proud of this new discovery, and after some research, it seems the band has a fairly substantial following. Receiving attention on platforms such as Naver On Stage and KBS’s All That Music, the band is becoming increasingly pronounced in the music scene. Locking in the first of more names to come, Sons of Tiger’s upcoming album release is definitely one to look out for. Moving on to another venue in Hongdae, DTSQ‘s performance at Club FF sounded like it would pack a punch. Characterising themselves as musicians playing “neon-coloured music,” the band sure managed to plug themselves as an intriguing act. The alternative rock band was already in the middle of their performance when I entered the venue. Surprisingly, the small venue was packed with people. The band might be foreign to many unfamiliar with the indie scene, and it certainly took a couple of tunes to grasp the band’s flavour. Swaying to a psychedelic track that later transited to an upbeat and jazz-rock fusion riff, these festival attendees seemed to be having a good time. The vocalist and guitarist Kim Su-hyun drew the attention of those in the dance floor with his seemingly flippant style of performance, though never quite losing the direction of each track. The audience was more than captivated, they had lost themselves in the music. However, though DTSQ was unique in defying genre boundaries, they lacked the edginess and appeal found in Sons of Tiger. As much as it was hard to look away from the performers with their bewitching sway over the audience, it was also hard to connect with DTSQ’s music beyond the level of being intrigued. The good thing about Zandari Festa was how I could easily hop over to Club Freebird for another performance. DABDA was a pleasant discovery after wandering about the streets of Hongdae at night. Describing themselves as pastel psychedelic, their performance was indeed an imagination of pastoral beauty. The vocalist, Kim Ji-ae, created a bubble of dreaminess to the small club setting with her drifting vocals. Backgrounded by a musing guitar melody, the performance seemed to extract itself from the passage of time at moments. The band’s use of electric guitars gave their music a roughness, though they continually managed to sustain a dream-like quality. Watching DABDA live and experiencing the atmosphere built up by their music was immensely fascinating. Yet, they seemed to lack a confidence with their own presentation. Their shyness drew their performance back and perhaps restrained their potential for greater stage presence. This was such a pity precisely because of the alluring dimension of their music – one that deserves to be showcased. Though not entirely polished as musicians, they proved themselves to be gems nonetheless – merely rough around the edges. Best experienced live, the first day of exploration ended with this dream-like saunter. Sunday was rainy in Hongdae, which spurred a general desire to be indoors. I worked towards fulfilling that wish. I sat myself in Evans Lounge for the day’s special stage, Danzzan Date, which translates to “Sweet and Salty Date” in Korean – an apt title for the Singaporean and Korean collaboration stage. The project brought together artists from Singapore and Korea to work on producing songs on the theme of food and love. 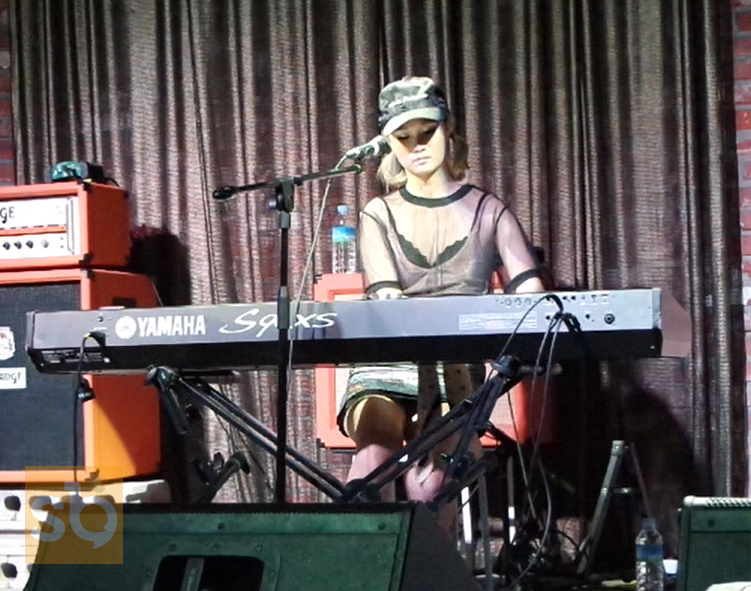 Singaporean acts Becka, HubbaBubbas, and Jean Tan, gathered with Korean musicians Dawn of the day, G.Urban, and Gonne Choi on Sunday to showcase their respective tracks. Alternating between Singaporean and Korean acts, it was interesting to see the exchange of content between a South Korean audience and Singaporean performers. Becka performed her song on Singaporean food, “So Sedap,” which translates to “So Tasty” in Malay. HubbaBubbas was delightful in their cheery song “Infinite Hand Hug Loop.” Their combination of an acoustic guitar with beatboxing to form the melody was an unexpected but also strangely heartwarming experience. Adorably encapsulating affection with the song’s lyrics of wanting to share cake with the listener, it was a warm hug on a dreary, rainy day in Seoul. Dawn of the day’s “Americano” was a beautiful addition to the repertoire of songs. The duo, consisting of Hyun Sae-rom and Lee Yong-ju, relied on a single keyboard and their vocals to deliver an impressive jazz ballad. Their voice, resonating through the high-ceiling basement, transformed the atmosphere of the room. The audience settled into a calm while admiring the soothing vocals of the duo. More importantly, the collaborative performance by Gonne Choi and Jean Tan embodied the international pulse of Zandari Festa. Being able to watch both musicians from different cultures, speaking different languages, come together to sing “Dandelions” was a truly wondrous image. The two musicians met as part of the Danzzan Date project earlier this year. Their continued friendship remains a comforting image of music’s potential in connecting people, reinforcing the importance of platforms such as Zandari Festa in bringing musicians together. However, the highlight of the showcase session was discovering G.Urban. G.Urban’s three-song performance though short, was entirely entrancing. Consisting of Hong Hyeok-su from MNET’s Voice Korea and Ra Kyoung-won from MBC’s Great Birth, the duo carves out their own form of R&B. Watching them live, they bring to mind a mix-mash of Zion.T and Dynamic Duo, added with a splash of Ra.D. A song that would approximate to G.Urban’s style is definitely Primary’s “See Through.” Listening to “I’ll give it to you” and “생각해” (translated to “thinking of you”), the balance in the vocals of the duo built a stable frame with boundless potential. Hyeok-su’s deeper, richer voice complemented Kyoung-won’s groovier flow. Fairly unknown perhaps even for those scouring the Korean indie music scene for endless hours, G.Urban should be finding their way into more spotlights with the rise of R&B musicians like Dean and Crush. Signed to Neverland Entertainment and being active together since 2014, G.Urban’s YouTube channel is filled with song covers of Winner, G.Dragon, DBSK, Heize and many more. These covers are well made and are proof of the brilliant vocals of the duo – the content lacking really are just original tracks. Out of the handful of original songs, “Feel So Good” is a recognisably classic R&B styled track, whereas “커피가 좋아” (translated to “I like coffee”) is an upbeat and cheery track. Both are worth a listen as an introduction to the duo’s music. Establishing a wide range of styles and creative boundaries, it is a shame G.Urban does not get the attention their talent deserves. Taken in by their musicality and style, one can only hope they push towards greater exposure and music production. Genuinely a sweet and salty date, the two-hour session certainly managed to capture the hearts of the audience. Following close after was a session with Today’s Hot Song, a folk indie duo. Armed with only an acoustic guitar, sparse percussions and their voices, they delivered song after song of sweetness. Cozied up in the comfy basement of Evans Lounge, accompanied by only a couple of fans, it was an intimate performance for a rainy Sunday evening. 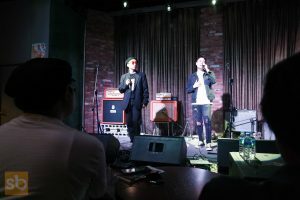 From Ed Sheeran’s “Shape of You” to their original songs like “Shut Up,” Taek Woo and Jung Gi-soo enveloped the room with their warm vocals and soothing acoustic melodies. Offering encore songs one after another at the request of the audience, the duo’s good-nature was a bonus to their honeyed vocals. The ambition to conquer all 11 venues and 140 bands was an unattainable one to start with, but I tried my very best sprinting about Hongdae in the short two days I had. 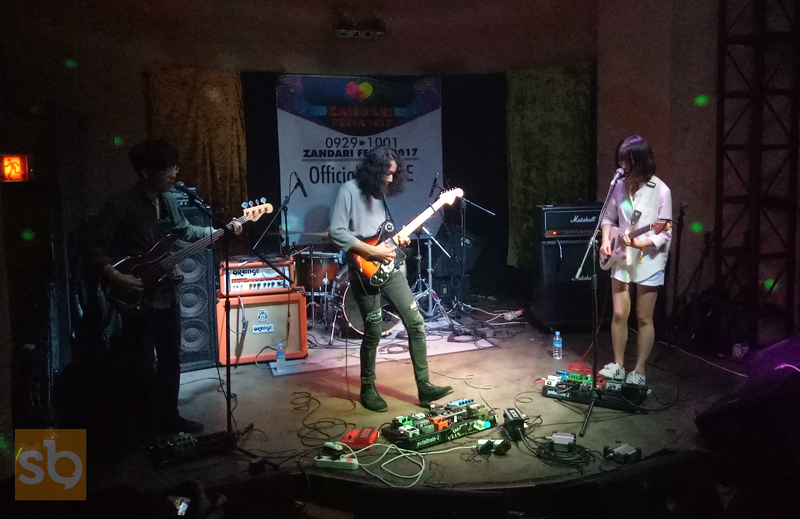 Zandari Festa 2017 was an eye-opening experience in terms of watching muscians, delegates and fans congregating from all over the world just to have a good time right before Chuseok. The intercultural exchanges that happen through music is always beautiful to watch. These events are a constant reminder that it is not about the number of fans, but simply the passion to communicate through music which matters most. 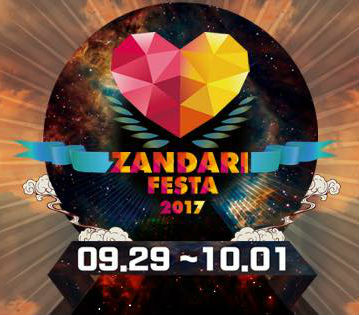 Zandari Festa was an entrance to the thriving underground music scene of South Korea in an incredibly short span of time. There remains an unimaginably vast world of music and talent waiting to be uncovered. Despite the drizzle and the intense amount of walking, the performers were ever cheery and passionate to alleviate any gloominess. The atmosphere was never down when an act took the stage. I put aside my genre preferences, delved into different realms of music, and in return I discovered so many more enrapturing artists I never would have been able to find if not for Zandari Festa. Hongdae has been redefined for me, and I can finally understand why it remains the heart of South Korea’s indie music scene. For those of you out there who do not have the opportunity to lose yourself in the winding streets of Hongdae, you should definitely check out the full line-up – you’ll never know what gems you may find.